“My village is under attack…”; “I need to go to war”. These are the words we will hear from the people around us every day. As urgent and panicky as it might sound, no war is happening in the real world but it is happening in the virtual world. Yes, there are clash of clans happening online, where the players are building communities, training troops for battle, attacking other players to earn gold and elixir. In this article, the writer who is an avid player himself tries to look at this epic combat strategy game Clash of Clans (COC) as a form of escapism from the real world. It was a humid afternoon at the dentist’s. My dad was in for a root canal procedure. Quiet shadows making vague movements could be seen through the frosted windows. The nervous silence that one finds in the waiting rooms of dental wards was however absent. The clamour of something like the clink of coins echoed through the room every few minutes. The other patients awaiting their turn peered curiously towards the source. It came from the direction ofa rather haughty young lady who was probably in her 20s sitting in front of me. She was busy with her smartphone and seemed unaware of her surroundings. How was she minting money right in the dentist’s ward? Curiosity got the better of me, and I strained my neck to spy on what exactly was happening on her phone. She sat there playing a game, oblivious to the worries of the other patients, unmindful of the pain the old granny she had come with was experiencing. The granny seemed perturbed, and from the way she winced periodically in pain, I feared the worst- she was here for an extraction. Suddenly, I could hear the painful dying groans of women coming from her phone. This obviously had an effect on the granny. Her eyes winced in fear of anticipation of the pain one always expects at the dentist’s. A victorious trumpet blew. The young lady smiled in accomplishment. She had won a war, while sitting beside her granny, at a dentist ward. I would later come to know that this game was Clash of Clans. 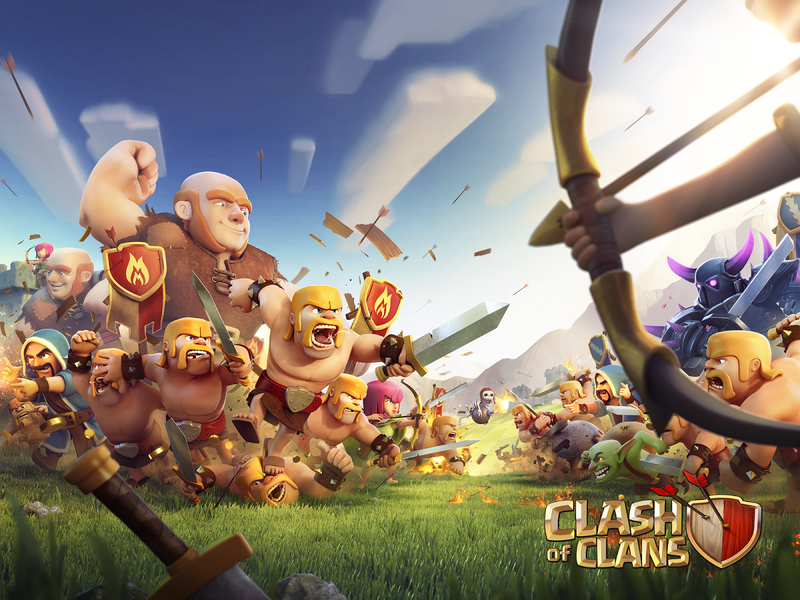 Clash of Clans is a strategy video game released for Android and iOS platforms. It is a freemium game which means users do not have to necessarily pay money to play it. In Clash of Clans, the player assumes the role of the leader of a village set in the medieval ages. The player can attack the villages of other players for loot, and simultaneously upgrade the armiesas well as the defences of his own village to protect it from raids from other players. This game also allows users to join ‘clans’, chat with other players, and help each other with troops, and war with other clans. So what is it about this game that makes it so popular? I knew I had to try it. After three failed attempts of downloading the game, through a network that was supposed to be 3G, I finally had the game. Players are required to choose a username, and I named myself ‘Belfire’, the son of the mythical wizard Rumplestiltskin. When I play the game I am no longer an Assistant Professor of English, but a fierce warrior who can do anything to save the interests of his village. I know a friend who is the sweetest person ever, who wouldn’t even hurt a spider. Yet on this game, she is known as ‘Wicked Witch’, and is a ruthless warrior. Games like these form an escape from reality and the accomplishments I achieve by moving my fingers do bring a sense of fulfilment. It allows me to be a hero, and save the day. After all, isn’t that what we all want? And so it began. I started getting notifications at 2am- “Your village is being raided by Mirea!” Who was Mirea and what had I ever done to her? Why was she raiding my village! A man who can never even get up at 6am to jog was now wide awake at 2am exacting revenge from Mirea for destroying his village. I learnt to attack other villages (might I add without the slightest feeling of guilt), and felt satisfaction as my warriors collected the loot. My village was constantly raided as well, and the notifications would come pouring in. If I did not open the game for too long, a notification would read “Come back, your warriors need a leader!” Oh how could I ignore such a plea! I found myself engaged in prolonged talks about war strategy with my friends. Gamers argue that it has positive aspects as well. It allows one to relive childhood mythical stories of gallant medieval wars, it fosters a sense of team spirit – crucial for winning clan wars, and tests the problem solving and reasoning skills of players on the basis of how well they are able to strategise. Each war is new, and each day is unpredictable! It is this unpredictability which makes the game appealing. Whenever I feel I am perhaps taking this game too seriously, I can just visit any one of the many Clash of Clans Facebook groups to participate in virtual discussions with other players. A clan search reveals more than 70 ‘clans’ existing in Nagaland alone- ‘Naga Warriors’, ‘Padampukhri’s, ‘Chumu Kings’ and many others.Clash of Clans, since its release in 2012, has become a part of pop culture. Clash of Clans is taking the mobile gaming world by storm, and as such, is possibly a revelation into the human psyche and our deepest desires. Maybe we are bored with modernism and democracy, and want to go back to the medieval ages; and maybe we prefer mythical heroes to real ones. Perhaps, the scariest thought is we prefer fantasy over reality. Whats so great about COC? Just hate that one friend who never talk and knows only how to play COC. People might get a better leisure with the coming of this game but what good is a game that kills leisure?